Inbound Marketing continues to explode not just across the Internet nor businesses but, also as a philosophy and pratice that brings value to both the market-place and the individual. It has become the new form of personal development designed to improve the quality of a business's culture and suprisingly, the lives's of single or divorced men called MGTOWs. Now, Inbound Marketing "since 2006, has been the most effective marketing method for doing business online. Instead of the old outbound marketing methods of buying ads, buying email lists, and praying for leads, inbound marketing focuses on creating quality content that pulls people toward your company and product, where they naturally want to be. By aligning the content you publish with your customer’s interests, you naturally attract inbound traffic that you can then convert, close, and delight over time". In essence, Inbound Marketing is a strategy to attract like-minded individuls to each other so as to exchange information or seek a solution to a common problem they share. 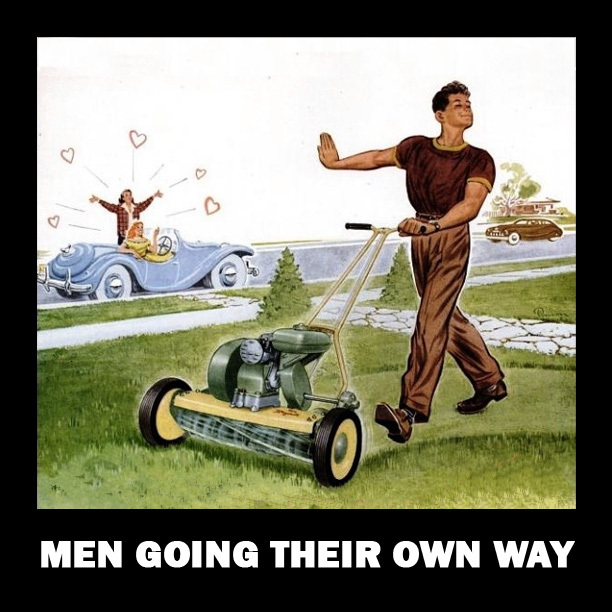 In the immortal words of the rock band Fleetwood Mac, “Go Your Own Way” and that's what many men are doing, they are “Men Going Their Own Way” or better known as MGTOWs. Yes, the movement is growing, the reasons are clear and the benefits are obvious. Now, what does mgtow and home business have in common that would make it a symbiotic relationship? Well, the main benefit is both economic independence and relationship building. Now, the traditional route many men take in life is to tie the Old Noose...I mean Knot and become a husband/father;however, both institutions are now businesses and monestised for the benefit of Women and State. Indeed, both alimony and child-support are billion dollar industries and the costs for both continue to rise where society has more single adults than married ones (it's about time)......I wonder why? Ask yourself the question is the business of marriage and fatherhood worthwhile investments? Well, from a male perspective the answer is increasingly “NO” due to current gender-bias laws that treat men unfairly. So, let's look at anther alternative to women and children, that appeals to men. Yes, money and power which ironically is the ultimate aphrodisiac that attracts women. Want money and power then, home business provides the ideal opportunity for men who want to AVOID female and govt control of their lives. If, this appeals to you then, continue to read. In some ways marriage has evolved into a home business where after the divorce long-term residual income is still generated in the form of alimony (Temporary, Rehabilitative and Permanent). Imagine, continued payment to a former partner years after the separation. Clearly, not a wise investment for any intelligent businessman because you are receiving no current value. So, as a MGTOW how about a business relationship where you develop an Intimate-Partnership with customers/clients because you recognize the benefits of a WIN-WIN situation, while bypassing the Cost-Benefit Analysis of Marriage and eventual, Divorce (50% failure rate and women initiate proceedings 70% of the time). Now, “You, are your business and you represent what your business is all about”; therefore, success or filure is all based on you and nobody else. Makes sense; therefore, investing in yourself to become a better businessman or man is critical to your survival. So, are you ready to increase your value and skills as a home business owner/entrepreneur and generate Consistent, Predictable and Long-Term Residual income for yourself and not your former partner? If yes, then, I invite you to examine our information and eliminate any self limiting beliefs that are costing you money and accelerating your arrival in the MLM Cemetery. Oh yes, since attorneys are involved in marriages the following famous quote should always be kept in mind, "an attorney with a briefcase can steal more money than a hundred men with guns and masks”.